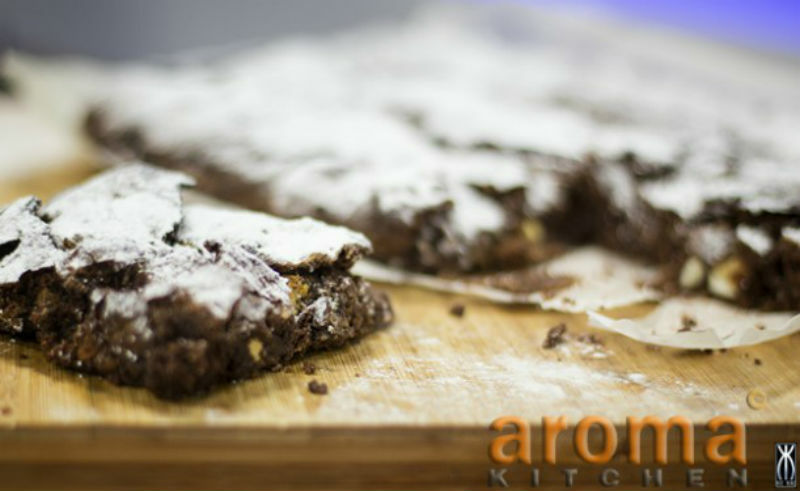 Indulge your taste buds to this heavenly triple chocolate brownie. Take the best of chocolate to create a brownie that the whole family will love. 1. Preheat the oven to 170C/325F/Gas3. Line a 30cm x 20cm cake tin with lightly buttered greaseproof paper. 2. Put the dark chocolate and butter in a large bowl, place over a pan of simmering water and allow to melt. 3. Sieve the flour and baking powder into a bowl and set aside. Remove the melted chocolate from the heat and stir in the sugar. 4. Add the eggs and vanilla essence. Fold in the flour, nuts and remaining chocolate chunks. 5. Pour the mixture into the prepared cake tin. Place in the oven and bake for 40-45 minutes. 6. The top should be firm but the inside should feel soft when cooked. Allow to cool in the tin. 7. Remove the brownies from the tin and cut into squares.